Team player. Hard worker. Coachable/ Disciplined. High soccer IQ. High passing accuracy. Has the ability to pass and shoot with both feet. I have played soccer since I was 5 years old, mostly as a midfielder. I prefer to play attacking mid, which allows me to take control of the ball in the final third and create goal-scoring opportunities. I’m a hard worker in school and on the field, whether it be pushing myself to be first to the ball or studying hard to ace that calculus test. My family has always been amazingly supportive and committed to helping me get where I am; they’ve helped shape me into the self-motivated person I am today. I want to find a program where I can learn and improve as a player, while at the same time excelling academically. Alai is a strong central midfielder with good size and a very strong leg. 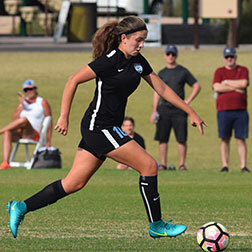 Alai plays for FC Prime ECNL and currently plays in a 4-3-3 attacking system. She has a vision, good decision making, and can make all types of passes necessary in the attacking 1/2. Alai excels in the classroom and is looking for a strong academic program.